Valve shows off a prototype of the Steam Controller, a new peripheral for living-room gaming. The game publishers claims the Steam Controller offers a vastly superior controller scheme than traditional game controllers. The wireless input device has two circular trackpads that are driven by your thumbs, these trackpads are clickable, just like the touch-enabled surface in the center of the controller. In total, the Steam Controller has sixteen buttons! 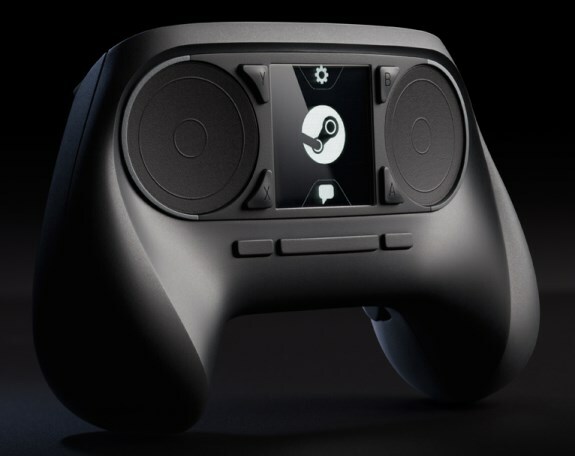 Valve says the controller is compatible with any version of Steam and that it's designed to work with all current and future games, even if the game doesn't support a gamepad. Full details and a link to sign up for the beta test can be found at Valve's website. Trackpads, by their nature, are less physical than thumbsticks. By themselves, they are “light touch” devices and don’t offer the kind of visceral feedback that players get from pushing joysticks around. As we investigated trackpad-based input devices, it became clear through testing that we had to find ways to add more physicality to the experience. It also became clear that “rumble”, as it has been traditionally implemented (a lopsided weight spun around a single axis), was not going to be enough. Not even close. The Steam Controller is built around a new generation of super-precise haptic feedback, employing dual linear resonant actuators. These small, strong, weighted electro-magnets are attached to each of the dual trackpads. They are capable of delivering a wide range of force and vibration, allowing precise control over frequency, amplitude, and direction of movement.